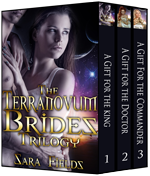 Three Hot New Releases, a New Stormy Night Author, and a Good Deal on a Great Trilogy! This week we have excellent new releases for you from Ava Sinclair, Emily Tilton, and first-time Stormy Night author Tabitha Rayne, along with a three-book trilogy from Sara Fields at a great price. The next section of A Scandalous Arrangement is also ready and waiting below. When she was still a carefree, lovestruck princess, Avin of Windbourne would have happily surrendered herself to Lord Xander of Ravenscroft, the bold, handsome warrior who was to have been her husband. But now, as a queen defeated in battle and forsaken by her people, Avin is determined to remain defiant even as Xander usurps her throne. Leading a rebellion against the woman he had hoped would be his bride was the last thing Xander wanted, but her father’s murderous betrayal of his closest allies left no other choice. Yet though Xander does his best to convince himself that Avin shared in the responsibility for her father’s actions, he can’t help wondering if she was merely a pawn in a treacherous game. Determined to win Avin’s submission, Xander sets out to master her body completely, and soon enough she has been stripped bare, soundly spanked, and made to kneel at his feet and eat from his hand. But even though her arousal at such shameful treatment cannot be denied, she is far too proud to yield to his dominance without a fight. Can Xander find a way to conquer the beautiful, feisty queen and claim her heart before his own father’s scheming tears the kingdom apart? Publisher’s Note: Conquering the Queen includes sexual scenes and spankings. If such material offends you, please don’t buy this book. Elizabeth McCoy’s husband has always been a perfect gentleman. But as they travel by ship to Canada to start a new life, she cannot help longing for something more, and after a terrible indiscretion on her part during the voyage she finds herself begging him to take her in hand. Recognizing that his wife needs to be sternly punished and thoroughly dominated, James bares her bottom and spanks her soundly before taking her in a hard, demanding way that is unlike anything she has ever experienced. Her husband’s skillful mastery of her body excites Elizabeth more than she could have ever imagined, but will his strict discipline free her from her guilt before it tears their marriage apart? Publisher’s Note: Her Stern Gentleman includes spankings and sexual scenes. If such material offends you, please don’t buy this book. By the time eighteen-year-old Heather Bradshaw returns home for the summer after her first year of college, she feels very grown-up indeed. With her parents away for several months, she has the house to herself, and she isn’t going to let their old-fashioned notions of propriety get in the way of a good time if the opportunity presents itself and the guy is hot. It comes as quite a surprise, though, when the man who sets her heart racing turns out to be her best friend’s father. Upon realizing that Heather is flirting with him, Tom Malley sets out to play the role of the gentleman. He does his best to ignore her advances rather than take advantage of someone so inexperienced, but it quickly becomes clear that the beautiful, naïve young woman is in desperate need of a man’s firm hand, and if he doesn’t provide the stern dominance that is required she’s going to get herself in over her head while searching for someone who will. Determined to put a stop to Heather’s out of control behavior and keep her from getting hurt, Tom takes the feisty girl over his knee for a long, hard, bare-bottom spanking that leaves her blushing and promising to behave herself. The humiliating chastisement merely intensifies her desire for him, however, and her response to his discipline deeply arouses Tom as well. Soon enough, he casts aside his hesitation and claims her thoroughly, but will the shame of surrendering her body to her best friend’s father turn out to be more than Heather can bear? Publisher’s Note: In Loco Parentis includes spankings and sexual scenes. If such material offends you, please don’t buy this book. Ashe Barker's latest release, Her Alien Commander, has made Amazon's Top 100 for Science Fiction Romance! Congratulations, Ashe! Mated to the Warriors, the second book in Grace Goodwin's Interstellar Brides series, has spent the last day in the Top 100 of all books on Amazon's Kindle Store and it has climbed as high as the #2 spot in the Science Fiction Romance category! It is also currently in the Top 10 bestselling eBooks on Barnes and Noble and is #1 in the overall Erotica category on Kobo! Congratulations, Grace!